I found out about the study abroad trip to Prague about the same time I felt the desire to travel to somewhere-anywhere!-for a personal reboot. I was fortunate in that I’d already spent several years living in Europe but I was eager to return again. I never made it to Prague my first time around Europe, but this trip was well worth the wait. Prague is an amazing city! It has amazing history, it’s easy to navigate and it’s relatively inexpensive. Our trip consisted of several evening events including the opera and the orchestra. We had organized trips to Karlovy Vary, Teplice, Terezen and Cesky Krumlov. My friends and I also booked an additional trip to Kutna Hora Ossury to see the “Bone Church”. Although, all of these short excursions were interesting, my favorite, by far, was Cesky Krumlov. This lovely little 13th century town is a UNESCO World Heritage Center. It’s referred to as the “Little Prague”. The centrum of the town is just a 15 minute walk from the train station. The narrow roads curve between tall buildings and there’s something wonderful to see around every corner. I could have easily spent a few days just exploring this wonderful city. My only regret in taking this trip (or any kind of study abroad program) is that i didn’t take it when I was first in college 20+ years ago. I’m a firm believer in that everyone should travel to different places and experience new things. What better time to do that than when you’re young and in college. My advice is this: If you have the opportunity to study abroad, no matter how long the duration, take advantage of the opportunity. You can learn so much when you step out of your comfort zone. I did. 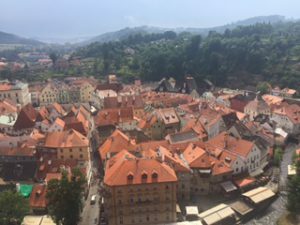 This is the view from the tower at Cesky Krumlov.